Cam Bearing Bore ID: SVO 2.203" - 2.205"
Cam Bearing OS: +.010", +.020", +.030"
Cam Bearing Press: .002" - .003"
Freeze Plugs: Standard Ford Press-in cup plugs 1-1/2" O.D. 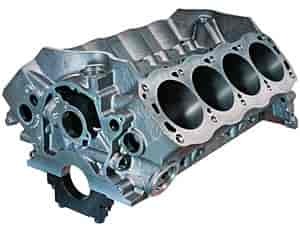 Main Thrust Width: .926" - .928"
Main Cap Press: .003" - .004"
The Dart Iron Eagle Small Block Ford Engine Blocks put Ford racers in front with these cast from superior iron alloy engine blocks. Working with leading Ford racers and engine builders, they designed the Iron Eagle Race Series and Sportsman small blocks to solve the shortcomings of production engine blocks used in high performance and competition applications. Dart blocks for Fords are produced on dedicated tooling and machined on state-of-the-art CNC equipment. They added the features that Ford racers need to build powerful and reliable engines. Staring with the small block Ford's big achilles heel, the oiling system! With Dart's vastly improved oiling system, the need to "band-aid" the oiling system with a high volume oil pump is a thing of the past. Using a standard oil pump and today's lifters, without restrictors, makes engine assembly easier and eliminates the guess work of determining restrictor size. Factory stock engine blocks were designed to be mass-produced economically and to operate in a passenger car environment. Original equipment oiling systems are typically restrictive and feed oil to the top of the engine first. The common practice has been to use a high-volume oil pump to offset these shortcomings and help the main bearings get more oil to survive. Dart aftermarket blocks have been designed with a less restrictive oil system which feeds oil to the main bearings first; a "priority main" oiling system. Many of us in this industry are inclined to use a high-volume oil pump due to history. However, this causes excessive oil to the top of the engine. Restrictors are then used in the lifter galleys to reduce the amount of oil to the top. Modern lifter designs typically have small oiling orifices which restrict the oil reaching the top of the engine. Using a standard -volume oil pump with current lifter designs and the Dart priority-main oiling system eliminates the need for restrictors, simplifying engine assembly and taking the guess work out of oiling system design. Siamesed Cylinders: Standard 4.000" or 4.125" cylinders can be safely bored to 4.185" diameter. Extra-thick walls prevent cracking and produce excellent ring seal. Scalloped Water Jackets: Increase coolant flow around cylinder barrels to prevent detonation, extend engine life and produce consistent cylinder temperatures. Steel Four-Bolt Main Bearing Caps: Sportsman Blocks have three 4-bolt center caps with splayed outer bolts for maximum strength, Race Blocks feature all five 4-bolt mains, rear cap uses standard 1-piece seal. Stock Components: Provisions for stock motor mounts, accessory drives, smog pumps, starter brackets, oil pans and pumps. Upgraded Oiling System: Has a complete stock-type system plus a low-tension priority main oiling system with front and rear external oil pump feeds. Dual Crossovers: Allow oil flow to be metered with restrictors for roller lifter cams and/or roller rocker arms to reduce oil flow and windage. Reinforced Head Bolt Bosses: Blind tapped to prevent leaks and produce accurate torque readings. Extra-thick decks prevent head gasket leaks. Standard Camshaft and Cam Drive: Standard cam and cam drive can be used. Lifter valley of Sportsman Blocks have provisions for production hydraulic roller lifters. Precision CNC Machining: Ensures consistent high quality and eliminates expensive "blueprinting". JEGS 80040 - Engine Stand 1000 lbs. JEGS 80042 - Engine Stand 2000 lbs. JEGS 80041 - Engine Stand 1250 lbs.